(2012.201.B0262.0416, Oklahoma Publishing Company Photography Collection, OHS). 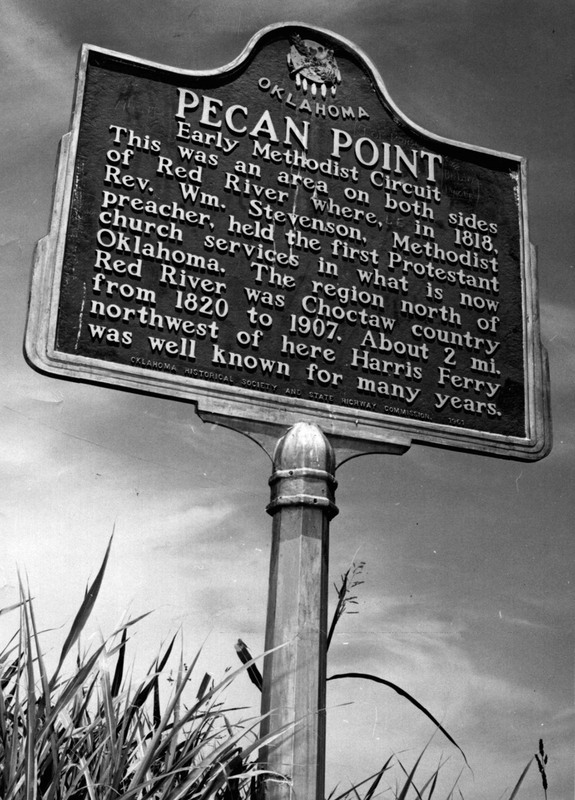 Pecan Point is a term describing an early-nineteenth-century settlement scattered on both sides of the Red River in present southeastern Oklahoma and northeastern Texas. This part of the river's channel has changed course innumerable times to the north, south, east, and west over many centuries, creating numerous cutoffs, oxbow lakes, and bayous. A generally accepted geographical placement puts Pecan Point approximately two miles south of present Harris, in McCurtain County, Oklahoma. In the vicinity is the Harris Bend Cutoff of the Red River. Across the river in Texas is the Red River County–Bowie County line. The area is a wetland created by the Red River's twisting, snakelike route. In 1815, when United States citizens began to settle in the area, the Red River formed the boundary between the United States and Texas, then a Spanish province. The newcomers were primarily hunters, traders, and miscreants. Given the river's torturous path, these individuals may not have understood precisely the nature of the international boundary. According to the memoir of a circuit-riding Methodist preacher named Rev. William Stevenson, when he commenced his ministry in this area in 1815, traders were settled on the "Spanish Texas" side. Historian Rex Strickland, however, asserts that Pecan Point was a widely scattered area of settlement that came about gradually on both sides of the Red River in 1815–16–17. In April 1820 the legislature of newly established Arkansas Territory created Miller County, which included part of southwestern Arkansas, all of McCurtain, Choctaw, and Pushmataha counties and part of Le Flore and Latimer counties in present Oklahoma, and part of northeastern Texas. In March 1820 the U.S. Army forcibly removed many of the settlers from the north-side Pecan Point settlements by burning their houses and crops. Most moved across the Red River into Spanish territory. Further complicating matters was the October 1820 Treaty of Doak's Stand in which the land in the northern watershed of the Red River, nearly thirteen million acres including much of Miller County, Arkansas (and the Pecan Point area), was ceded by the United States to the Choctaw in exchange for their homelands in Mississippi. Despite these issues, the Pecan Point area continued to be inhabited by transient Americans who hunted, settled briefly, traded, and moved back and forth from Arkansas to the Choctaw cession to Texas. Strickland indicates that after 1828 settlement and use of the area by whites ended. The State of Oklahoma maintains a historical marker titled "Pecan Point," on State Highway 87/U.S. 259 near the Red River. The marker states: "This was an area on both sides of Red River where, in 1818, Rev. William Stevenson, Methodist preacher, held the first Protestant church services in what is now Oklahoma. The region north of Red River was Choctaw country from 1820 to 1907. About 2 miles northwest of here Harris Ferry was well known for many years." Ted A. Campbell, The Autobiography of the Rev William Stevenson (Dallas, Tex. : Tuckapaw Media, 2012). Rex Strickland, "Establishment of Old Miller County, Arkansas Territory," The Chronicles of Oklahoma (Summer 1940). Rex Strickland, "Miller County, Arkansas Territory, the Frontier that Men Forgot," The Chronicles of Oklahoma (Spring 1940). Rex Strickland, "Pecan Point," Handbook of Texas Online, www.tshaonline/org, accessed September 28, 2017. "Pecan Point," Vertical File, Research Division, Oklahoma Historical Society, Oklahoma City. Dianna Everett, "Pecan Point," The Encyclopedia of Oklahoma History and Culture, https://www.okhistory.org/publications/enc/entry.php?entry=PE006.